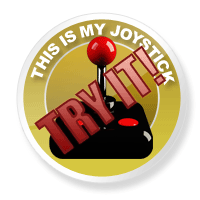 Review: Star Wars: The Force Unleashed 2 Review - This Is My Joystick! Since its creation in 1977 the Star Wars universe has grown to be one of the most prominent in entertainment history. Although usually associated with a certain stereotype, its huge presence in pop culture is undeniable. Aside from the movies it can probably be argued, though, that no other Star Wars product had really enjoyed mainstream success. The Force Unleashed was released in 2008 and became the fastest selling Star Wars game ever, hitting over 1 million sales worldwide in only its first month. Ultimately, it went on to become the most successful Star Wars game ever made. Despite a number of serious gameplay issues The Force Unleashed was a game I deeply enjoyed playing. It bridged the gap of the events between episodes 3 and 4, adding new characters to the lore while also delivering a surprisingly solid story. The player assumed the role of Galen Marek (codename, Starkiller) Darth Vader’s secret apprentice who is ordered to hunt down the remaining Jedi. You were referred to as the ‘Human Wrecking Ball’ with the devastating power of the Force at your disposal. The Force Unleashed 2 takes place a short time after the first game. Now on Kamino, Starkiller is once again under the service of Darth Vader, although, things are not as they seem. Vader tells Starkiller he is a clone and that the original had died on the Death Star. The apprentice is haunted by visions that aren’t his own, a side effect of the cloning process according to the Sith Lord. Starkiller realises Vader’s true intentions for him and launches his escape from the Clone Army’s home world. The Force Unleashed 2′s storyline is probably the most underwhelming part of the entire experience. Certain plot points just manifest themselves into the game without any genuine explanation. Starkiller’s spontaneous visit to Dagobah is probably the clearest piece of evidence. Supporting characters seldom get any screen time dissolving any chance of growth or development. You hardly even see Juno Eclipse the whole time and when you do, there’s almost no dialogue from her. I found the character of General Kota to be significantly less likable than I remember from the original. He served more as a nuisance than an ally for a large part of the game. Cameos from fan favourites Yoda and Boba Fett contribute almost nothing to an already weak premise. In truth, I found Yoda’s presence did more harm than good. As mentioned, Starkiller’s visit to Dagobah is one of the most pointless and unnecessary detours I can remember in any game. Let me just say, you’re off the planet as quickly as you arrived on it. You visit only two separate worlds to Kamino and don’t even fight on one of these. The ending does the game even less justice by coming dangerously close to disrupting an important Star Wars event. I’ve always believed narrative to be a strong aspect in the series but sadly, The Force Unleashed 2 fails to capitalise on its predecessor’s. 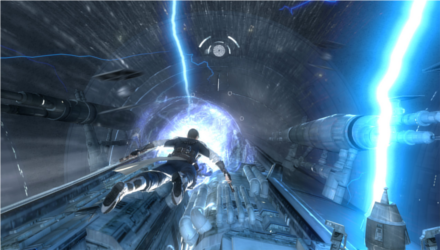 "I can see my vat from here"
The Force Unleashed 2 is a third-person action game with a similar gameplay style to God of War. Starkiller’s two main weapons are his lightsabers and the Force. Yes that’s right, lightsabers, plural. Starkiller now has an extra lightsaber which guarantees plenty of cauterising fun, right? Wrong. 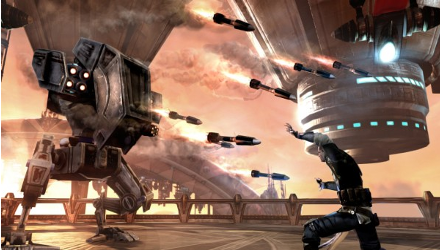 The Force Unleashed 2’s melee combat is very much a one button-mashing bore fest. The whole process felt mechanical for the most part and frankly, your lightsabers feel like nothing more than overgrown glow sticks. Even the newly added dismemberment gets tiresome after you’ve beheaded a legion of stormtroopers. The extra lightsaber doesn’t alter the combat in any way and it certainly doesn’t empower you anymore than one had. When thrown, the sabers leave Starkiller completely vulnerable to attack as they are his only means of blocking. In all honesty, I feel like the lightsaber has never been properly utilised in the Force Unleashed series. This is a weapon of pure energy, it amputates with one strike at a foe and yet a common stormtrooper can withstand multiple hits. I understand that it’s just how the gameplay works but that doesn’t make it right. To say it’s just a game isn’t a viable excuse to oust any canonical logic. Starkiller is a chronic Force user and he makes it well known. Amongst his (few) new Force abilities is the Mind Trick. This allows him to temporarily turn an enemy against his comrades and if close enough to a ledge he’ll jump off. Latter stages of the power will actually cause the victim’s head to explode. You gain Force Points for every defeated enemy and these make it possible to upgrade your Force powers; each of which has three stages. A very basic HUD displays Starkiller’s essentials including Force Fury. Force Fury is a brief stage of invincibility and sheer power he experiences at times. All of his powers and abilities are dramatically increased making him capable of crushing even AT-STs with relative ease. It became a useful ability against larger enemies and in crowded areas. Though the melee combat could have been better handled, I was very satisfied with using Force powers. However, I believe that a few more could have been added as my arsenal eventually felt limited and overused. The same can certainly be said about the quick time events. These can be triggered against the majority of larger enemies. Unfortunately, only the same quick time event applies to each enemy type. The fact that you can’t skip in-game cut-scenes sums up a topsy-turvy campaign. One of the most complained about issues of Force Unleashed was how difficult it was to lock on to targets. Unfortunately, sequel’s targeting system isn’t much of an improvement. A button must be held in order to use Force powers as well as blocking, so why do the same with targeting? Consequently all three are jumbled together making combat more frustrating than I could bear. The platforming brought even more frustration. The inconsistency of it at times left me completely speechless, and Starkiller’s inability to hold on to ledges seems strange. It doesn’t make sense that something so integral to gameplay would be given such little attention to detail. At certain stages during the campaign you’re thrust into some skydiving sequences. During these you’ll come up against different obstacles such as TIE Fighters and debris. You can use your different Force powers to redirect these obstacles or evade with a swerve. The way these unique situations changed the style of play made them some of my favourite during the game. There’s even a boss fight in mid-air at one point which could have been done better but decent nonetheless. One of my more surprising discoveries was how incredibly buggy the game is in spots. I found some enemies still standing after being killed and sequences not triggering when they’re supposed to. On one occasion a boss fight failed to load because the platform I was on had been stuck in a loop. For a game that looks incredibly polished Force Unleashed 2 has its fair number of bugs. The game’s ridiculous linearity doesn’t do it much good either. Holocrons aside, there is hardly anything to explore in the few places you visit. As well as a campaign there is also a challenge mode where you can test various skills ranging from combat to Force and platforming. This was without a doubt my favourite feature in Force Unleashed 2. Not only did I have fun doing each challenge but I felt more tested than even on harder campaign difficulties. The only downside was the short number of challenges available. The Force Unleashed 2 is one of the finer looking games around running on the Havoc, Euphoria and Digital Molecular Matter (DMM) engines. These three are primarily physics-based engines which allow items to be interacted with. When Force Lifted, enemies will struggle to hang on to crates and their limbs sway quite realistically when moved around. Starkiller’s constant interactions with the environment mean even minor objects are finely detailed. Stormtroopers look as they should although their iconic armour is almost too clean, there’s hardly a hint of roughness. The computer generated cut-scenes are some of the best I’ve seen, showcasing truly breathtaking cinematics. Motion-captured scenes brought a number of characters close to life occasionally. Character animations are excellent; mind controlled stormtroopers are one of the more amusing things you’re likely to see. Though I never found myself standing around taking in the beauty of my surroundings, the visuals were striking at times. Sam Witwer and other voice actors return to lend their words to The Force Unleashed 2. The voice acting is quite impressive and the sound effects are competent. The storm in the opening sequence on Kamino was a few cracks of lightning away from coming alive. Traditional Star Wars music is audible in most parts of the campaign. To be honest I’ve heard enough of the score to last a lifetime. I dare not knock on John Williams’ legendary work but hearing The Imperial March theme every time Darth Vader enters a room has become stale. I realise the theme itself is very much part of Vader’s being but it would be refreshing to hear something different. A respectable effort, in general, but not a lot stands out. Will it shock your Jawa? The Force Unleashed 2 was one of my most anticipated games in 2010 and after playing it, I wish it had spent longer in development. The biggest disappointment for me personally was the terrible lack of narrative direction. I honestly felt offended by how the whole thing unfolded or even failed to. Basically, too many questions were asked and hardly any were answered. Brief appearances from Boba Fett and Yoda seemed more directed to fan service than the plot. It was painfully predictable and the ending is uncomfortably close to a key Star Wars incident. The gameplay felt like (pardon the pun) a direct clone of its predecessor’s in almost every sense. No significant issues from the original were addressed while the six hour campaign is far too short to warrant a purchase at full price. It was visually impressive and the surprisingly fun challenge mode kept me entertained but I just feel like more could have been done. It’s certainly not the worst game out there but it’s also not one that deserves true recognition.